We had a really nice Christmas this year at our home. We followed many of the Bolivian christmas traditions, having the kids open their presents at midnight on Christmas Eve, shooting fireworks, etc. We even had a surprise visit from Santa, who politely rang the door bell because we don’t have a chimney. On Christmas day, we had a huge meal and invited the Tsubaki family to share the night with us. We were lucky to find a store downtown in the warehouse district that sold Chinese fireworks. 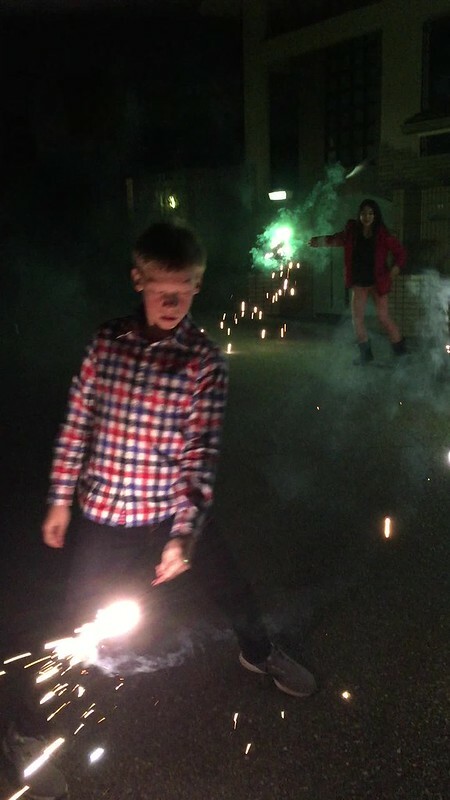 The kids enjoyed shooting the sparklers and watching the exploding tubes after dinner. Legos were a hit with Ocean and Oliver and Owen received the wireless, Beats headphones. Nadia got a Kitchen Aid super blender and a beautiful winter coat. I got a drill and a charging station. It was a bright sunny day with temperatures around 10C, so we did spend some time outside. Yesterday for Boxing Day, Ocean and I ventured downtown to the beautiful Izumi Hall for a music recital. We went out for her favorite chai latte and cinnamon roll at Starbucks afterwards.